The Tamil Homeland Parents of Disappeared Forum has called for Sri Lanka to be referred to the International Criminal Court and for a United Nations peacekeeping force to be deployed to the North-East, as families continue to search for their missing children. The organisation, made up of families of the forcibly disappeared based in Vavuniya, said they had been protesting for more than 719 days, demanding the return of their loved ones. We lost friends who were protesting with us, the mothers of abducted, who died because of the extreme psychological effect on them,” said the organisation, in a letter to the UN Human Rights Council. Their letter comes after yet another Mullaitivu mother died yesterday still in search of her daughter, who was disappeared during the final stages of the armed conflict in 2009. 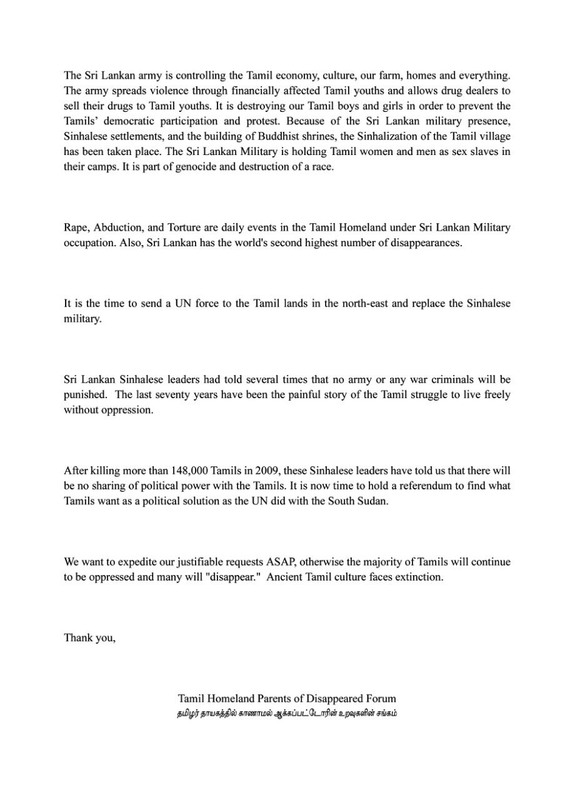 The letter went on to slam the continued Sri Lankan military presence in the Tamil homeland, stating the army is “controlling the Tamil economy, culture, our farm, homes and everything”. It also called on the UN to ensure that a referendum was held to determine a political solution for Tamils on the island. “The last seventy years have been the painful story of the Tamil struggle to live freely without oppression,” it concluded. 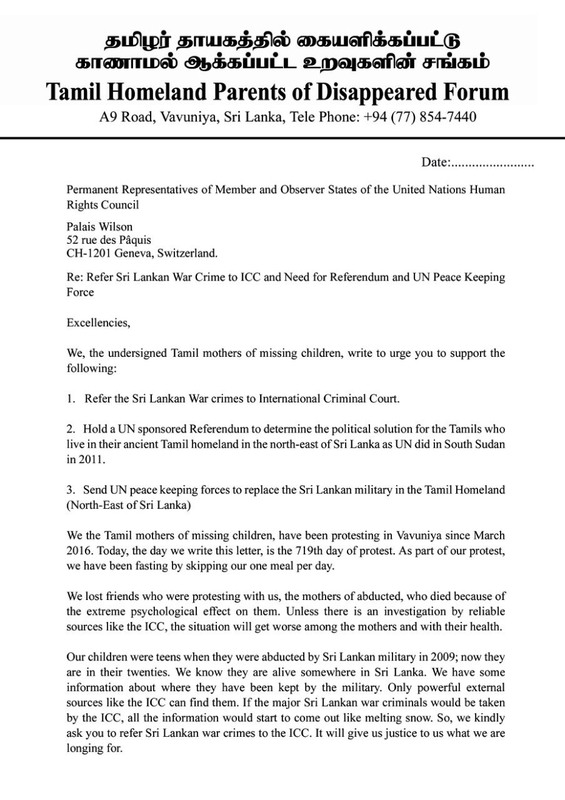 The call for Sri Lanka to be sent to the ICC has been echoed by several Tamil organisations across the North-East, as well as in the Tamil diaspora around the world.